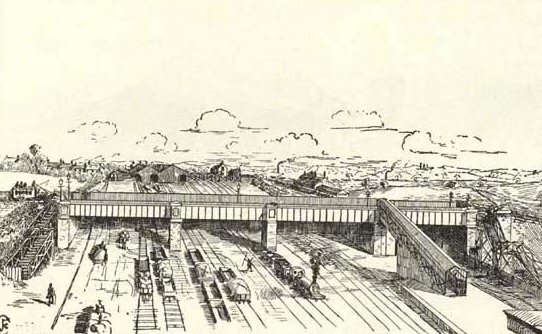 Sketch from "Cockburn's Ossett" of the bridge on Station Road, Ossett as seen from the new station. The bridge was built to a width of 30ft. and was narrower than the rest of Station Road, which was 36ft. wide. The road bridge was 270ft. long and slightly skewed, carrying Station Road over the railway's premises. There are four spans, two of them being 70ft. long, the others 57ft. and 45ft. respectively. The main girders, 9ft. deep and 27 inches wide and weighing about 30 tons each have their extremities supported on piers and abutments of solid brickwork, panelled with stone caps. Cross girders, 32ft. long by 2ft. 6 inches deep are covered with corrugated iron "trough flooring." The latter has its upper surface filled in with concrete, asphalted over, and the roadway laid on top. The sides of the bridge were boarded internally to a height of 6ft. on each side, so as to prevent horses from taking fright at passing trains. There is a headway of 15ft. beneath the bridge. Some 300 tons of ironwork were used. At the northern end there was a broad flight of wooden steps on each side, leading to and from the goods yard. The southern abutment was arched over a footpath (leading from the Green to the bottom of Intake Lane), and there is also a flight of steps at the same end of the bridge, communicating with a footpath on the west side. The entrance to the station was provided by a covered passage or inclined gangway, 130ft long and 6ft. wide, with a gradient of one in eight, leading from the bridge on Station Road down to the platform (right of picture above). This passage was supported partly on brickwork (forming a store room underneath) and partly on iron girders. At the end in Station Road, the passage was provided with doors. The passage and the platform were originally lighted throughout with Bray's patent lamps. The platform was also fitted with fire hydrants and other fire extinguishing apparatus, and similar ones were fitted in the goods department.